M45 is one of the most prominent objects in the night sky. 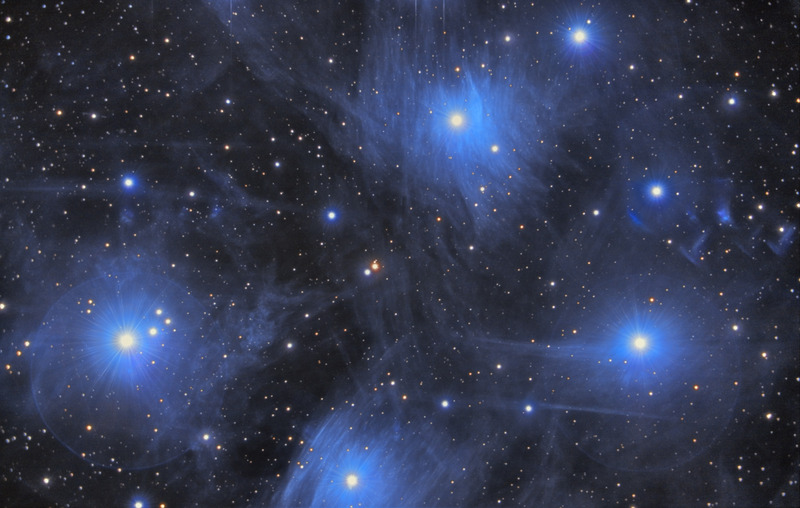 To the naked eye, the Pleiades looks like a miniature Little Dipper. Observers with good vision will easily identify 7 stars, and this gives the Pleiades its nickname - the Seven Sisters. In actuality, the cluster contains over 1,000 stars. The cluster is a very young cluster, and is dominated by hot, blue stars. M45 is passing through a dust cloud in the Milky Way. As a result, the blue light from the brightest stars reflects off the background dust, thus causing the blue nebulosity surrounding the cluster. In this image, North is Up. This image is cropped to 95% of the original frame. Software Used Images Plus 4.0 for camera control, calibration, and stacking. Images Plus 4.5 for digital development, and multiresolution sharpening, smoothing and noise reuction. Photoshop CS5 levels and curves, color correction, high pass filter, star shrinking, saturation adjustments, lab color, smart sharpen, screen mask invert, match color, HDR toning and multilayer luminance combining. Gradient Xterminator for gradient removal. Carboni Tools for additional saturation adjustments, noise reduction, and smoothing. HLVG for additional color correction. Notes This astrophotograph includes images taken from the very first night I used my new Gary Honis modified Canon 450D. Although the modification is designed to enhance red objects, I was very excited to see how well the new camera performed - even on this predominantly blue target. Additionally, the camera picked up a great deal of red in many of the stars, as well as some very subtle red in portions of the dust. I'm very excited about the potential the new camera shows. This is the second processing of this image. 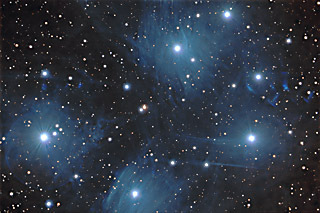 A previous processing of this image won 1st place in Digital Astro's Challenge Photo - Star Cluster category for December 2011. A previous processing of this image also earned 2nd place in Astrophotogallery.org's December 2011 "Easy-Open Cluster" category.